This week we've progressed to two meals a day! What a challenge that has become. Now we have over come one it's on to another. Emily has loved trying new foods. However while she has been trying new ones, shes found a firm favourite! She used to eat a variety of things and happily do so, but since she's tried banana's she seems to have come to a decision that if she hasn't got banana's then she isn't eating it. The reflux has continued to improve, she's barely sick now. The solids have actually improved everything, her mood is better, she is even sleeping better. 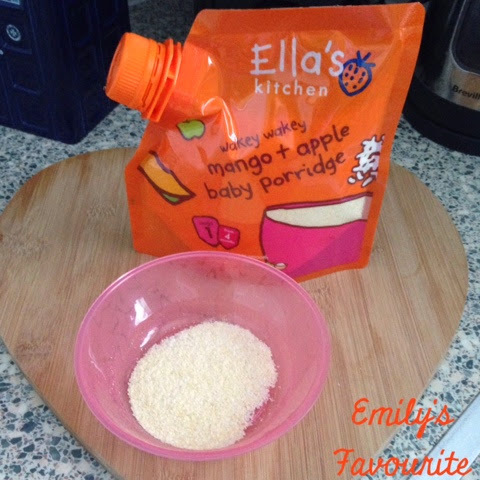 Emily is loving Ella's kitchen products, massive thumbs up too them. She loves the mango and apple porridge, it is the only thing that she will have warmed. Everything else has to be room temperature else she creates and isn't interested anymore. I have been adding one of there first tastes little apple pouches to the porridge, just to give it that little bit extra taste. She will have a bottle at 8, then have her breakfast at 10.30. This has had a knock on effect with her sleeps, she'll happily go down for a nap about 11-1. 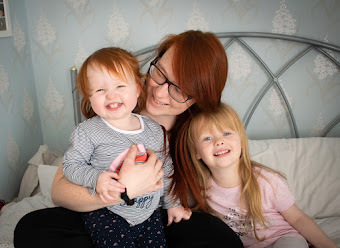 The other other little news of this week is, Emily has started using the handles on her bottles, She has been trying to hold them herself for a little while now but I didn't really think much of it. I saw these little tommee tippee handles in Tesco while doing our shopping and decided to give them a whirl. She loves holding the bottle herself, she grips it very tight. I can't believe that she's growing up so fast. Where did my baby go. Are you and your little one weaning? Any recommendations on how to get Emily to eat something other than bananas?